"After the shooting of the non-human entity], taking command was a new and unfamiliar team of Blue Berets that suddenly descended onto the scene, just moments after the runway had been cordoned off. With speed and efficiency, 'they took over,' he said, 'and when asked who they were, we were told nothing and ordered to stay outside the ropes.'" 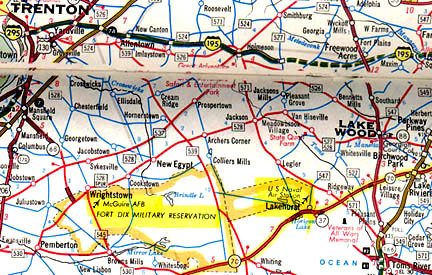 McGuire AFB and Fort Dix Military Reservation near Wrightstown, New Jersey, are near the U. S. Naval Air Station in Lakehurst, New Jersey. The bases are about 45 miles east of Philadelphia, 50 miles south of New York City, 60 miles north of Atlantic City and 10 miles west of the Atlantic ocean. The Fort Dix / McGuire Air Force Base / Lakehurst Naval Air Station complex covers 42,000 acres. To be more computer-friendly, the reprint has been divided into parts. Here begins Part 3 of Status Report IV, written for the June 28-30, 1985, MUFON 1985 UFO Symposium Proceedings in conjunction with the national MUFON conference held in Saint Louis, Missouri. The series of status reports, I through VII, were written by Leonard H. Stringfield from 1978 to 1994. Previous Status Report V begins at Earthfiles 012805. Leonard Stringfield died on December 18, 1994.